No More Wisconsins! Defend Our Unions! Class-struggle Painters union activist Wyatt McMinn, above center and below, arrested by Vancouver, WA police during September 5 union protest against "right-to-work" union-busters (above right, in suits). This past September 5, Cross Trade Solidarity, a labor group in the Portland, OR/Vancouver, WA area, called a rally to protest a meeting of the union-hating “Freedom Foundation.” This right-wing outfit has launched a drive to enact deceptively named “right-to-work” laws in the Pacific Northwest in an attempt to strip away basic union rights. While several dozen picketed outside the meeting at Clark Community College in Vancouver, a number of union members went inside, whereupon the labor-haters showed their idea of “freedom” by calling the police to kick the protesters out. 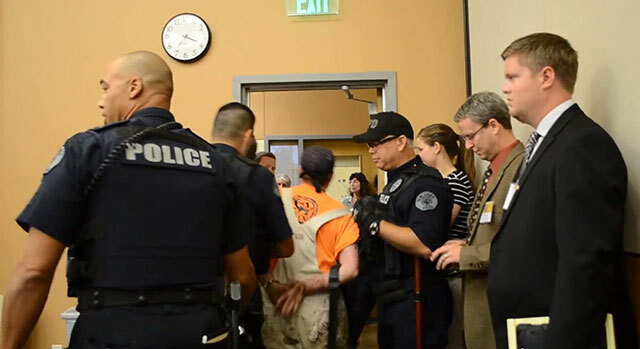 When the cops arrived and ordered protesters out, Wyatt McMinn, vice president of Local 10 of the International Union of Painters and Allied Trades (IUPAT), responded that he didn’t appreciate being “profiled.” He was immediately arrested and led away in handcuffs on the bogus charge of “trespassing” in this public meeting. 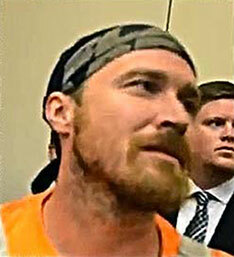 At a November 6 hearing in Clark County Court, McMinn pled not guilty to the charge of first degree trespassing. On this outrageous trumped-up charge, the union activist faces up to 364 days in jail and a $5,000 fine. We urge all supporters of unions and of the rights of working people to come out in support of Wyatt. 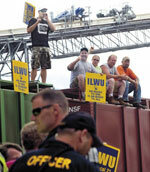 Wyatt McMinn most recently spearheaded a campaign for active solidarity by area unions with the locked-out workers of International Longshore and Warehouse Union (ILWU) locals at grain terminals in Portland and Vancouver. Six union locals passed motions (see box) pledging to support a mass mobilization to defend the port workers, but the ILWU International then put the kibosh on a mass picket. Wyatt was also active in winning the backing of a number of local unions to denounce repression of Industrial Workers of the World (IWW) members (see “Portland Unions Denounce FBI Raids, Grand Jury Witch Hunt of Activists,” The Internationalist No. 34, March April 2013). Cross Trade – set up to bring construction workers from different trades together, defend each other’s picket lines, and promote workers power regardless of jurisdiction – called the September 5 rally in order to expose the union-busters and their anti-worker agenda. The right-wing “libertarians” of the Freedom Foundation, headquartered in Olympia, Washington rail against “government interference” in private business while seeking to use the government to prevent unions from representing all workers at a workplace, even when this has been agreed to in collective bargaining. While vituperating against “welfare handouts,” the “right-to-work” hypocrites would outlaw contracts providing for an agency shop, which would make unions foot the bill for freeloaders who enjoy the benefits of union wages without paying dues or agency fees. This would also threaten hard-won union rights like seniority protection and the union hiring hall, while weakening the ability of unions to enforce strikes and pickets. 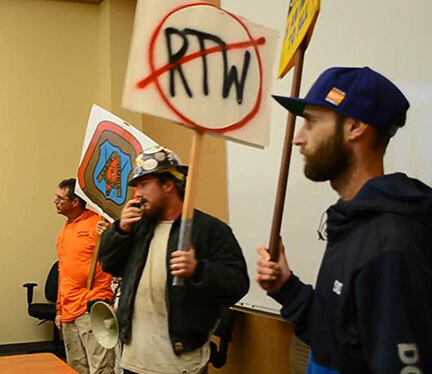 “Union-busting has got to go!” Workers protest September 5 “right-to-work” forum in Vancouver. While posing as defenders of the rights of non-union workers, the Freedom Foundation is funded by anti-union billionaires including the Walton Family Foundation (owners of Walmart), the Sarah Scaife Foundation and other right-wing financiers. The group’s founder, Bob Williams, is closely linked to the American Legislative Exchange Council and other far-right lobbyists funded by the billionaire Koch brothers and the Heritage Foundation. Other Freedom Foundation supporters include Scott Walker, the notorious union-busting governor of Wisconsin, and the right-wing hate-mongering TV commentator Glenn Beck. It’s no accident that “right-to-work” laws mainly exist in the South where unions are an endangered species. The AFL-CIO has put out materials showing that workers in states with such legislation earn $1,500 less per year on the average than those in states without such union-crippling laws. But recently “right-to-work” laws have spread to Midwest industrial states such as Indiana and Michigan. Facing the right-wing campaign to put such anti-labor initiatives on the ballot in Washington and Oregon in 2014 elections, the short-sighted labor officialdom thinks that by business-as-usual lobbying and legal maneuvers they will go away. As the “right to slave” forces gear up in several states, the unions have learned the wrong lesson from Wisconsin. There at least you had tens of thousands of unionists in the streets before the labor tops sold out the struggle to the Democrats. Today, with the threat of effectively losing the right for public workers to bargain collectively looming, the leadership of the major labor groups has refused to mobilize to stop it this assault in its tracks. Citing several recent polls which indicate that voters may be in favor of “right to work” laws or are sour on unions, the union tops have stepped back from direct confrontation with right to work groups. Relying on polls as an indicator of what unions should be doing to mobilize their members is myopic. But more than that, it ignores the fundamental problem: that until the unions do something worth supporting, they won’t gain the trust of the millions of workers who need them. What’s needed instead of an ad campaign or anemic membership outreach is a real mobilization of workers in the streets and in the plants to defend the right to union shops, seniority and simple majority rule for workers forming a union. The way to stop the union-busting assault of the Koch brothers and their cronies, is to organize the unorganized by using workers’ power to withhold their labor. Faced with the labyrinth of anti-labor laws, a fighting union movement would defy the likes of the Taft-Hartley ban on “secondary boycotts” and shut down non-union firms with mass picketing. But to do that, and defeat union-busting outfits like the Freedom Foundation, a class-struggle leadership must replace the sellout labor bureaucracy now sitting atop the unions. And when our brothers and sisters stand up to the anti-union bullies, all of labor must support and defend them. “In my experience,” McMinn continued, “one of the biggest roadblocks in the organized labor movement is the AFL-CIO bureaucracy.” At the September 2013 state AFL-CIO convention in Bend, Oregon, where McMinn was a delegate, the bureaucrats advised attendees not to mention unions, “because unions don’t poll well.” “I think that’s the problem with organized labor,” Wyatt summed up. “We don’t attack enough. We should be proud to be in unions, even if that’s the minority.” The way to defeat “right to work” is by showing up to oppose them wherever they raise their heads, and also to “fight the bigots who hide under the Tea Party banner,” such as the American Freedom Party, outright Nazis who have begun to organize in Portland. Earlier this year, Wyatt McMinn was instrumental in leading an effort by class-struggle unionists to build solidarity with locals of the International Longshore and Warehouse Union that have been locked out at grain terminals in the Portland/Vancouver area. The following resolution, passed by seven Portland-area union locals and labor bodies including ILWU Local 5, LIUNA Local 483, IUPAT Local 10, UBC Local 156, IATSE Local 28, SEIU Local 503 Stewards Council, and UA Local 290.